Many California farmers produce food in ways that protect public health and the environment, but too many others use practices that take a serious toll on the state’s water resources. A slew of agricultural pollutants, including fertilizers, pesticides, pathogens and sediment, are seriously damaging California’s surface and ground water, poisoning fish and threatening drinking water for many communities. Amid the growing urgency to address these problems, policy makers and regulators are putting increasing pressure on farmers to curb agriculture-related pollution. Citing costs and lack of resources, many farmers have been slow to respond, but this may soon change as stricter State Water Board regulations for managing nitrogen and farm runoff go into full force in the Central Valley and Central Coast Water Districts. Federal farm bill conservation programs administered by USDA’s Natural Resources Conservation Service (NRCS) provide tens of millions of dollars a year in financial and technical support to help California farmers and ranchers reduce water pollution, build healthier soil, protect air quality, enhance wildlife habitat and improve water conservation. 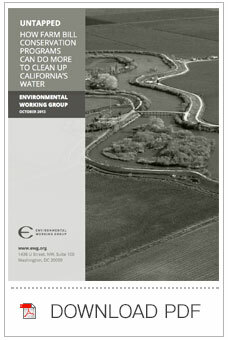 EWG analyzed the two programs that constitute the state’s most significant resource for combatting nutrient and pesticide pollution – the Environmental Quality Incentives Program (EQIP) and the Agricultural Water Enhancement Program (AWEP) – focusing on how much funding is being devoted these critical problems and whether it is being spent most effectively. EWG’s analysis found that overall, California farmers too often fail to use these programs to support land management practices that NRCS considers highly effective for addressing nutrient and pesticide pollution. Instead, the lion’s share of EQIP and AWEP funding for practices that combat nutrient pollution goes to pay for structural installations such as irrigation, cement infrastructure and animal fences. In fact, half of this funding goes to purchase and install irrigation equipment, and 24 percent finances infrastructure to manage and treat the millions of tons of waste generated by dairies and cattle feedlots. More efficient and well-designed irrigation systems can help reduce nutrient pollution of surface and ground water, but far less costly knowledge-based and vegetative practices – such as nutrient management, conservation tillage, cover cropping and filter strips – are more effective, as documented in a key NRCS technical document. Yet just 11 percent of the funding for practices that reduce nutrient contamination goes towards these kinds of practices, which generate other valuable ecological benefits as well. These include conserving water, enhancing soil and plant health, reducing greenhouse gas emissions, promoting biodiversity and adapting to climate change. EWG’s analysis also show that the efforts of both federal programs to reduce pesticide pollution rely most heavily on the installation of micro-irrigation systems. Nearly 80 percent of funds spent on NRCS-endorsed practices for “reducing harmful levels of pesticides in surface water” go to irrigation systems, which alone will not guarantee significant reduction in pesticide use or pollution. Micro-irrigation can help reduce pesticide runoff and leaching, but these toxic chemicals still escape into the air, soil and water during spraying sessions and after heavy rains and windstorms. Other management and vegetative practices are crucial for reducing pesticide use and preventing water contamination, but only 20 percent of the resources spent on practices with greater potential to cut pesticide pollution go to support vegetative and management practices such as cover cropping, residue and tillage management, field borders and filter strips. The emphasis on building expensive structures or buying high-priced equipment comes at the expense of investing in less costly, highly effective land management practices that could help more farmers, cover more acres and achieve greater environmental benefit per dollar invested. Stretching scarce conservation dollars to address multiple resource concerns simultaneously and reach more farmers is especially critical given the difficult fiscal environment, which results in turning away 60 percent of applicants every year due to lack of funds. Targeting more resources to encourage farmers to implement less costly and more effective management and vegetative practices – either alone or in combination with more efficient irrigation – would accelerate progress on stemming the nutrient and pesticide pollution threatening California’s ground and surface water. Seeking to steer funding to projects that deliver the greatest environmental benefit, in 2012 NRCS changed its systems for evaluating applications for cost-share assistance. This came on the heels of changes in 2011 aimed at better targeting financial assistance through smaller, more competitive funding pools around shared resource concerns in fewer regions. However, EWG’s initial analysis found little indication that these positive changes will alter the relative funding imbalance between expensive irrigation systems versus support for complementary integrated crop management practices. Our data also found that few resources were geared toward the Central Coast region, which has some of the most acute pesticide and nutrient toxicity levels in California. Because EQIP and AWEP are voluntary programs, NRCS cannot force farmers to choose particular practices. According to NRCS staff, many farmers do not request funding for these highly effective vegetative and knowledge-intensive management practices despite the staff’s efforts to promote them. This clearly speaks to the need for more technical assistance and regulatory mandates to induce adoption of higher-impact practices. In the meantime, there are ways that NRCS could create conditions that would yield a better balance in funding among structural, management and vegetative practices. Provide much higher points for contracts that include a comprehensive suite of management and vegetative practices to reduce nutrient and pesticide pollution or complete implementation of such systems. Give priority to applications for irrigation and Animal Feeding Operation (AFO) infrastructure submitted by producers who implement a comprehensive system, including management and vegetative practices, to cut nutrient and pesticide pollution. Do not give points for irrigation systems as a means to address water quality issues unless a suite of highly effective management or vegetative practices are already in place or are included in the application. Award higher points and create clear preferences for vegetative practices and management practices that score a 4 or 5 for their potential to address nutrient and pesticide issues in the matrix used by NRCS to rate the effectiveness of conservation practices. Encourage local and regional work groups to do grower outreach in the most impaired watersheds and to award high points for projects in highly impaired watershed districts. Eliminate all cost-share payment caps on crop management and vegetative practices. Cap cost-share payments for specific irrigation and AFO infrastructure practices to free resources for lower cost, high-impact practices. Create a more targeted initiative in the Central Coast region to overcome barriers and deliver conservation resources to farmers who qualify for cost-share assistance. Provide additional training, support and direction to field staff to ensure that they actively promote integrated, complementary and advanced management and vegetative practices along with irrigation and livestock management solutions for water quality issues. Intensify partnerships with state agencies, cooperative extension and non-profit organizations to accelerate training in integrated crop and livestock production practices and promote cost-effective best management practices. 5. Ensure that irrigation investments lead to significant water savings and minimize depletion of groundwater resources. Conduct an extensive assessment of the true water savings and impacts of NRCS-supported irrigation infrastructure investments. Consider measures to require farmers who receive cost-share assistance for irrigation infrastructure to provide assurances that they are using surface water when available. Restore the former policy of prohibiting the largest confined animal feeding operations from receiving EQIP dollars to build animal waste management structures and facilities. Authorize mandatory funding for the conservation loan program established in the 2008 farm bill to provide no- or low-cost loans for building structures and purchasing equipment; use the loan program rather than direct cost-sharing to help farmers make these capital investments.